This is a clever alternative to window blinds: porthole cushion liners (or porthole bung). 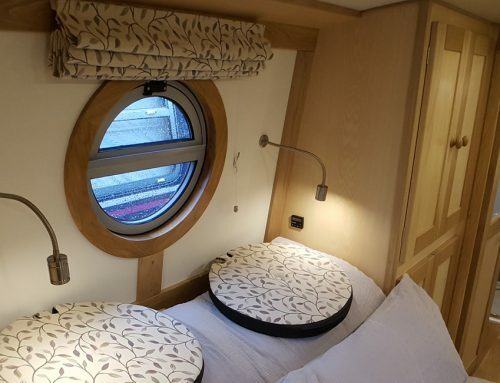 The Porthole Bung is designed to fit snug within your porthole window so during the night the window is covered and during the day it is removed and can become an extra cushion. The smallest size available for a Porthole Bung is 30cm in diameter. 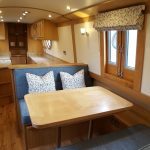 Aqua Furnishings offer luxurious and high quality curtains which can be supplied with pencil pleat, eyelets, tab top heading as well as pattern matching from the top and bottom. The smallest size available for curtains is with a width of 60cm and a drop of 60cm. Roman blinds are on a robust yet sleek headrail with side control chain. Available in over 120 beautifully designed fabrics, each chosen to complement the cabin interior using texture, co-ordinated colourways and fine patterns. With the addition of side press studs they will remain flush against the cabins angled walls. Furthermore, the supplied P clips adheres to the most recent safety standards meaning they safely hold the blinds mechanism together but also allow the removal of the blinds fabric to be washed when required. As an optional extra, you can choose press studs to ensure the blind remains flush with the wall, if you have angled walls. The control chain remains neatly tied back to any angled walls with a smart looking plastic clip. 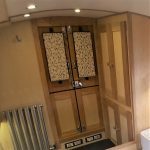 With a choice of fabric, linings, chain options and press stud addition you can truly make your roman blind bespoke to fit your boat. The smallest size available for Roman Blinds is a width of 50cm and a drop of 50cm. Luxurious and high quality roller blinds are available on a robust yet sleek head rail with side control chain. Available in over 65 beautifully designed fabrics, each chosen to complement the cabin interior using texture, co-ordinated colourways and fine patterns. With the addition of side guidewires they will remain flush against the cabin angled walls. Furthermore, the supplied breakaway connector and chain tensioning device not only adhere to the most recent safety standards, it also ensures the control chain remains neatly tied back. The smallest size available for roller blinds is a width of 50cm and a drop of 50cm. 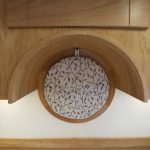 This is a clever alternative to a door window blind: the door window bung or panel is very similar to the porthole bung, however for the windows on the door. The bung or panel uses press studs to stay in place. Designed to fit snug within your door window so during the night the window is covered and during the day it is removed and can become an extra cushion. The smallest size the door window bung is available is with a diameter of 15cm. Also don’t forget that all of our products are made to measure, therefore a sales consultant will be able to help you with the measuring of the window, and will also help you to choose the products. Then any product purchased will be made to your specific measurements.